rec. live Wigmore Hall, London, 10 January 2015. DDD. rec. live Wigmore Hall, London, 7 March 2015. DDD. Having been impressed from the start of this series – I made Volume 1 a Recording of the Month – review – I’m very pleased to be able to review the last three releases. My Seen and Heard colleague Claire Seymour was also impressed by the concert which forms Volume 2 – review. (WHLIVE0085, Op.18/1, Quintet Op.29, Op.132). All six volumes contain music from Beethoven’s first forays into the format, Op.18/1-6, his middle period ‘Rasumovsky’ quartets, Op.59/1-3, Op.74 and Op.95, and his late quartets, Op.127, Op.130, Op.131, Op.132, Op.133 and Op.135. To begin at the beginning with the Op.18 quartets. These already marked an advance on the quartets of Haydn and Mozart and must have set some heads shaking in polite Viennese society. Some recordings play the music pretty straight and miss its revolutionary nature. 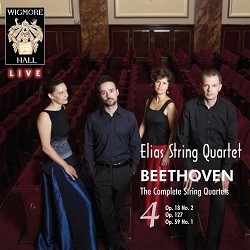 The Elias Quartet give it a little less of a push than the award-winning Belcea Quartet, whose complete set of the quartets is such an attractive bargain (ALPHA262, 8 CDs, around £34 but on offer for £25.50 until mid-January 2019; review – review of earlier release DL News 2014/8), but they nevertheless do bring out the spirit of these works. What I said of Op.18/4 in my review of Volume 1 applies to No. 2 (Volume 4) and Nos. 5 and 6 (Volumes 5 and 6 respectively): The Elias Quartet don’t over-emphasise either the Mozart/Haydn debt or the foretaste of the late quartets, though both aspects are made apparent from their strong and exuberant playing. To pick almost at random: the finale of Op.18/5 spills out of the speakers, not least because the recording is extremely good for a live performance. (NB: those averse to applause should be aware that a few seconds are retained.) They take a few seconds longer than the Belcea Quartet, but sound just as much as if they are enjoying themselves. If the first violin comes over prominently, that’s part of the deal with these early works. That’s certainly not to say that the Elias Quartet don’t find depth in these quartets; among the slow movements, that of Op.18/6 is particularly affecting, with considerably more room to breathe than the Belcea Quartet give it. The ensuing scherzo brings an equally fine account of music in a different mood, again a little slower than the Belcea performance but no less lively. Here, too, is the young Beethoven anticipating his older self with music which seems frequently to be curling back on itself, a feature well brought out by both performances. The Belcea Quartet follow Op.18/5 with the Große Fuge, Op.133; it’s a fine performance but the music is light years removed from what we have just been listening to, especially as the Belcea performance of Op. 133 slaps you in the face and leaves you in no doubt that this is powerful music. The Elias recording on Volume 1 sounds more like the unravelling of a massive puzzle. Both interpretations are valid, but the Elias Quartet remind us more of the composer’s debt to Bach, something which is not always fully appreciated: I once read an article by an academic who maintained that Beethoven never composed a fugue! I hasten to add that it’s Bach completely re-imagined. Incidentally, the Elias Quartet give us Op.130 twice over - on Volume 1 with its original finale the Große Fuge, on Volume 3 with the shorter replacement. I’m pleased that the six volumes of the Elias Quartet’s survey mostly place the quartets in chronological order. (The unavoidable exception on Volume 4 is necessitated by the length of Op.59/1.) It would have been possible to have squeezed the music onto five 2-CD sets but that would have necessitated shifting the order around. In any case, these sets are sold, at least in the UK, for not much more than the price of a single disc. You should be able to find them for under £13: beware of those who are charging much more - £17.92 in one case and even £15.98 for a download. Thus, on Wigmore Hall Live Op.18/5 is followed by Op.59/3 and Op.18/6 by Op.59/2. If the adagio ma non troppo of Op.18/6 is impressive, the molto adagio of Op.59/2 is even more so in the hands of the Elias Quartet. Once again, they give the music a little more space than the Belcea Quartet and it benefits, as it also does from a similar tempo from another of my top recommendations, the Takács Quartets (Decca 4708472: Op.59 and Op.74, 2 CDs or complete Beethoven Quartets 4831607, download only around £37 in 16-bit lossless1). Always prepared to kill two or more birds with one stone, I’m catching up with a Supraphon recording of quartets No.12 (Op.127 [34:32]) and No.16 (Op.135 [21:54]) from the Škampa Quartet recorded in March 2000, now download only from some dealers, though others still have the CD (SU3464-2 [56:47] – review). The first time that I heard Op.127 it literally stopped me in my tracks; how could such advanced-sounding music have been written as early as 1824? That was from the Budapest Quartet’s stereo remake for CBS, which is no longer available, though their earlier mono version is. I’ve been searching for a performance of similar intensity ever since and the Elias Quartet don’t provide it, at least not initially. What they offer instead is a performance of a different kind of intensity, stressing the aching beauty of the music, the thoughts that lie too deep for tears. That, too, is inherent in the writing, especially in the slow movement, so movingly presented here. Maybe it’s just not possible to bring out both the intensity and the beauty of this quartet on this side of eternity, but of the recordings that I know, the Takács Quartet come closest to achieving the double honours (Decca 4708492, 3 CDs, Complete Late Quartets, mid-price, or 4831607, Complete Quartets, as above). If it’s beauty of performance that you prize above all, the Elias Quartet are right for you, even if they don’t quite achieve the punch that I was looking for, especially in the first movement. In fact, that steely intensity, still intermingled with lyricism, does surface in the third movement and the finale, so overall this is a win-win performance that captures the spirit of what must have perplexed those first listeners – Beethoven’s development of a good tune which he then throws away or twists back upon itself with angular and hectic writing. The Škampa Quartet adopt faster tempi throughout, losing some of the effect of the maestoso marking for the first movement but gaining by making the music seem rather more off-beat than the Elias Quartet, albeit without the sheer power of the best performances. 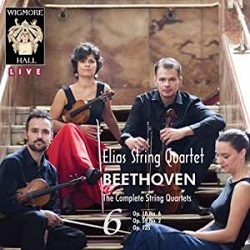 Peter Grahame Woolf in his review of this album noted that those who sought a greater sense of struggle in these quartets would be less impressed than he was, and I have to place myself in that category. Nor do the Škampa Quartet, for all the considerable accomplishment of their playing, achieve the same aching beauty as the Elias. PGW is not alone in admiring this recording, but I thought it overall just a little too perfunctory. Not only do the Škampa Quartet adopt faster tempi, they also observe far fewer of the repeats in Op.135, especially in movements three and four, reducing a work which from the Elias runs to over half an hour by almost ten minutes. They are not alone in this: the sturdy and reliable Kodály Quartet on Naxos (8.554594, with No.14) come in about the same time, as do the Emerson Quartet (DG 4743412, budget-price 3-CD set of the Late Quartets – review), the Belcea Quartet and the Cremona Quartet (Audite 92.680 SACD, with Nos. 6 and 11 – DL News 2014/8), while the Lindsay Quartet (Decca/ClassicFM, budget-price download, with No.15, 4820521), the Takács Quartet and the Quartetto Italiano halve the difference (Decca Duo, budget twofer, with Nos. 12 and 13 and the Große Fuge – review of alternative coupling). Op.135 is the pinnacle of Beethoven’s achievement even more than the late piano sonatas and I want to savour every minute of it, repeats included, so the Elias Quartet start with a big advantage from my perspective. In the opening movement they play by the book and the result is straight, not to say a little straight-laced, but the affective account of the slow movement more than atones; you won’t find the cantante e tranquillo marking better observed in any other performance. That’s the case with the adagio ma non troppo of Op.127, too; indeed, the slow movements of all the late quartets sound excellent in the hands of the Elias Quartet. The Belcea Quartet, too, give the slow movement of Op.127 plenty of space to develop, though that of Op.135 is a little less tranquillo than from the Elias Quartet. The Cremona Quartet on Volume 2 of their complete series (Audite 21454, 8 SACDs - review of Volumes 5-7) take a whole three minutes less in this movement, and though they can’t be accused of sounding perfunctory, they give the music less than ideal penetrative power (Audite 92.681, SACD or lossless download from eclassical.com2, with Op.59/2). The finale of Op.135 receives one of Beethoven’s somewhat enigmatic markings, Der schwer gefaßte Entschluß, as if he couldn’t decide how to compose it; then he wrote Muß es sein – Es muß sein, must it be – it must be. It’s clear that he intended to break the spell of tranquillity and, if the Elias Quartet do so a little less stridently than some, they certainly wake you up from your reverie and go on to lead you a merry dance. At times Beethoven makes the players sound almost as if they are sawing at their strings and the Elias don’t baulk at virtuoso renderings of these passages. For once the applause, replete with whistles and shouts, is allowed to run on. The Cremona Quartet on Volume 1 of their complete Beethoven series (Audite 92.680, or complete quartets, as above) are marginally less cantante in the slow movement of Op.135, though they offer a vigorous account of the finale to match – but not excel – the Elias Quartet. They lose out, however, by omitting repeats, so that the finale in particular, at 6:56 against the Elias Quartet’s 12:20, is over before one has even got into the swing of Beethoven’s style. For those seeking a complete set of the Beethoven quartets plus the String Quintet at an attractive price, the download versions of the Cremona Quartet complete set are very tempting: nine hours in mp3 from 7digital.com at £8.99, lossless with pdf booklet from Qobuz £16.19. (Don’t dream of paying £76.70 for the same thing or, indeed, £71 for the SACDs, which are available direct from Audite for €58.90). Even the Takács Quartet fall somewhat short here in the matter of repeats. Lovers of period instruments will turn to the Quatuor Mosaïques (Late Quartets: Naïve V5445, 3 CDs, super-budget price). There’s a great deal to be said for gut strings, as in the finale of Op.135, but even they give us short measure in this movement. I've mentioned the Lindsay Quartet super-budget download of Op.135 and Op.136. Those looking for a further bargain will find their very accomplished recordings of Op.127 and Op.131 on another Classic FM release (4820622): splendid performances available for just £4.95 (mp3) or £6.19 (lossless) from Presto; similarly Op.130 with Große Fuge (4820623). I recommended 4820622 alongside a coupling of Op.59/3 and Op.131 from the young Aris Quartet in Autumn 2017. Without going into detailed comparison, the Elias Quartet also offer just as thoroughly convincing an account of Op.131. I’ve already mentioned the Wigmore Hall recording quality – very good for live performances – and the booklets, presumably derived from the programme notes, are very useful. There’s certainly no detriment in terms of quality of performance, recording or presentation from the fact that these are live performances. All in all, unless you are totally averse to live recordings with a modicum of (well-deserved) applause after each work, this is a set of the complete Beethoven quartets at the very top of the list. The Belcea Quartet can be obtained as a set less expensively, even after the current offer expires. It’s regrettable that the complete Takács Quartet set disappeared so quickly on CD1; the download is not exactly a spectacular bargain (the lowest price for lossless is £37.66, with booklet). Overall the Takács recordings remain my benchmark but there are times, as in the finale of Op.135, where I prefer the Elias Quartet. Of course, there never was going to be a ‘best buy’, but the Elias Quartet are amongst the best, one of a select handful of recordings. The new ‘Recommended’ accolade applies to the series as a whole. 1 The attractive 7CD + blu-ray audio + DVD set on 4831317 seems to have disappeared almost as soon as it was released. But bear in mind the very attractively priced download of Op.127 and Op.131. 2 Disappointingly, there is no 24-bit and no booklet, both usually available from this source.